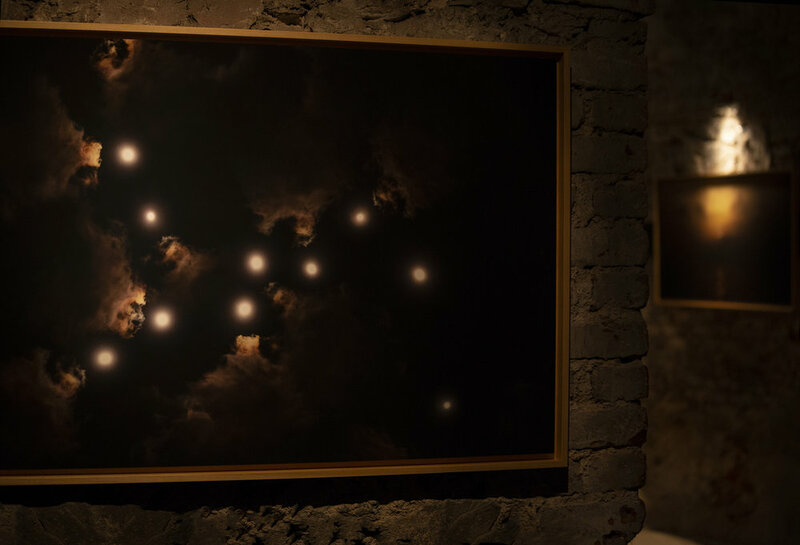 Mixer presents Mediha Didem Türemen’s second solo exhibition, “Myths”, at the historical Adahan Istanbul cistern, between 3 and 23 April 2018. With a focus on depicting an imaginary timeframe which could not be captured by photography, the artist’s new series presents an interpretation of nature, forced into metamorphosis. With her “Myths” series, the artist presents a production utilizing cinematography, photography and engraving, to convey the legends experienced by people who witness surreal moments due to changing climate conditions and unpredictable natural phenomena. At an uncertain time, in an ambiguous place, nature - which says "I’ve been here for ages" - is being forced to change. These changes are the consequences of the actions of humans. Nature presents a threat to human beings’ safety. It tells stories, and creates legends with its timeless storm, fog, sun, clouds. "Myths" is calling to testify against this stance. Is rhyming, the sprawling sun or several full moons at a time an illusion? Or is it a messenger from the future? Türemen's photographs developed during the process of studying Ingmar Bergman's Seventh Seal (1957) as her thesis subject. The series is a reflection of the film’s spirit and the aspects it is questioning. Describing the experiences and the fears of today’s people with materials of different ages in Seventh Seal - which he describes as a poetry essay - Bergman points out the age old common fears by using different time periods. Inspired by a quote from Ingmar Bergman, (acclaimed by the Time Magazine as the "greatest living filmmaker",) “Film, is a dream beyond the time it was documented.” The production will be dedicated to him with a note: “With respect to Bergman”. “Myths” forms part of the 100th anniversary celebrations of the director that will continue throughout 2018, under the directorship of the Ingmar Bergman Foundation in Stockholm. An interview on Bergman will take place during the 2018 Istanbul Film Festival. Mixer is pleased to host its visitors at Adahan Istanbul between April 3th and 23th for Mediha Didem Türemen’s “Myths” exhibition.